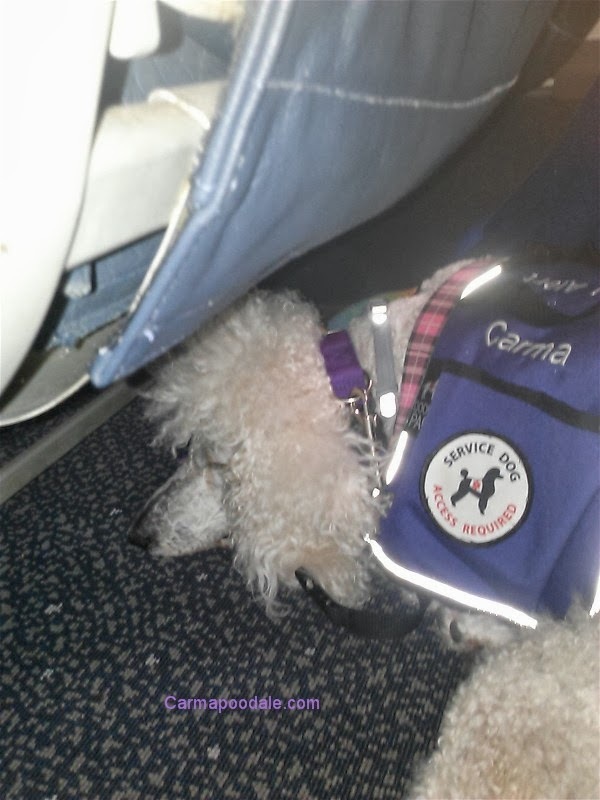 Recently ,I have seen a video that a passenger was removed from a plane due to allowing his service dog to sit in a vacant seat. After reading all the comments I will say 50 % were saying just let the dog sit there and the other 50% were saying "no, that is against the rules". The ones who were saying let the dog sit there was because it was a large dog. 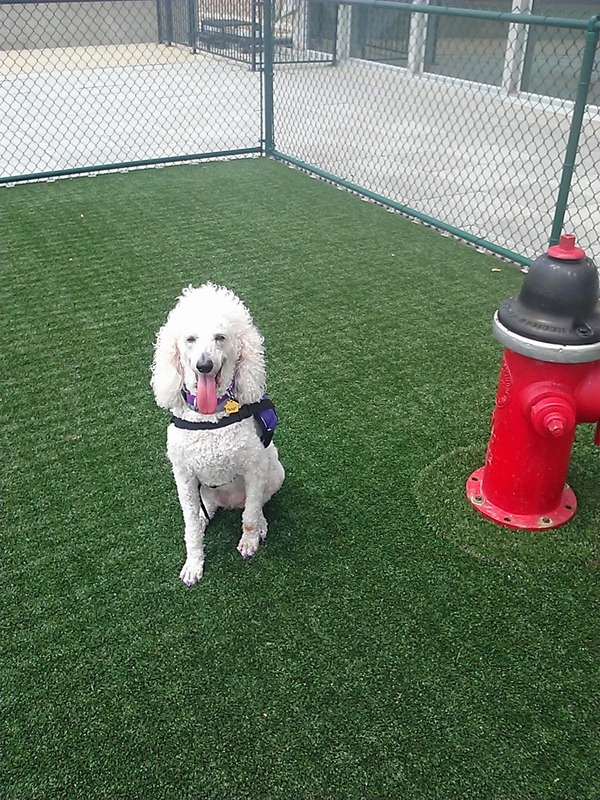 Service dogs come in all sizes but there are rules that a service dog has to obey in order for the dog to be protected by the ADA and ACAA laws. Before I fly, I always see my vet to get a health record. I have never had to show this to any airline but it's always best to have a physical before flying. I also carry my medical records, Canine Good Citizen test paper, and paperwork from ma's doctors that states I have passed all requirements to become a Service Dog. 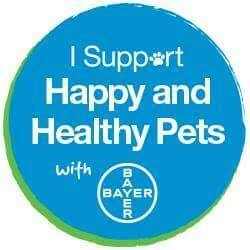 I also carry a card with the ADA Laws and my microchip card. Airlines are not required to ask for any of this but I would be rather safe then sorry. When people see me in a airport, I have heard them ask ma "where is she going to sit? She is too big" I am not too big. The first thing they should know is that I did not just show up at the airport, like SURPRISE! Whenever we are flying, my handler (ma) calls the airline directly and tells them that I will be flying with her. She books her seat and she calls the airline again 24 hrs in advance to make sure there was a note stating I will be flying with her. We have been on some cramped planes that even ma worried about me fitting. I have learned over the years to become a porta-poodle. I can become portable. I have flew on Delta, United Airlines and Cape Air and I am happy to say I have never had a problem. When we go through security , I am not required to take off my vest but I do. Ma thinks this helps to get through security faster. She will remove my vest , collar and leash and tell me to walk through the gate and stay. I will walk to the person on the other side, turn around, sit and wait for ma. After she walks through the machine they swab her hands and she puts my stuff back on me. Like I said YOU DO NOT HAVE TO DO THIS. We do it for convenience and to keep the line behind us moving. Plus I get lots of compliments from the person on the other side of the door. I strive on compliments. It means I am doing my job the best of my ability. I curl up on the floor between ma's legs. Sometimes this isn't comfortable but she always books the shortest flights that she can. Since Sissy Sarah always flies with us, I am able to stretch out a little more between the two of them but there has been times that we don't get seats side by side. 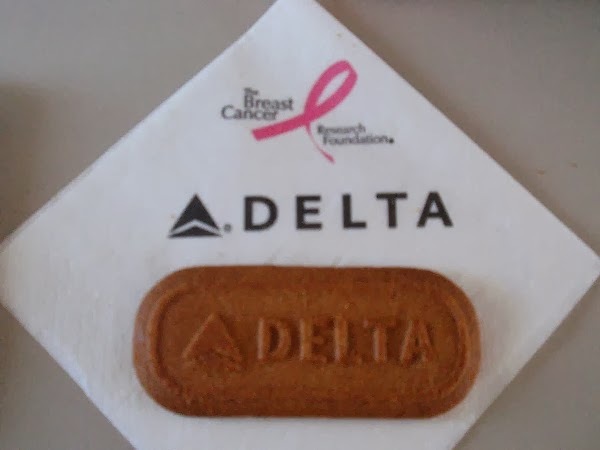 On Delta flying from Evansville Ind. there isn't as much room as other flights I have been on. My head can fit under the seat and I can stretch out a little more. Ma makes sure I am not in the aisle. Don't want anyone tripping over me. This can be a safety issue. Some ask why I don't fly in the bulkhead area of the plane where there is more room. The reason is I can't on the planes we have flew on. The bulkhead area is also a emergency exit and no service dog can be where the emergency exits are. In larger cities where we can catch connecting flights I have found that I get more room on larger planes. I can lay comfortably under the seats. All airports have potty areas for service dogs. Its best to check out the airport layout to find these areas before you arrive. Before we catch a connecting flight, ma always instructs me to stretch. This is so I don't hurt my back or get cramped legs. Hey, I am 7 yrs old so I am not a young pup! She also stretches so her legs don't bother her as bad from sitting. Having MS she has found she needs to stretch those muscles to make flying more pleasant. Ma loves their cookies too! Waiting to board the plane. Before flying on Delta, please check their rules for flying with a service dog. 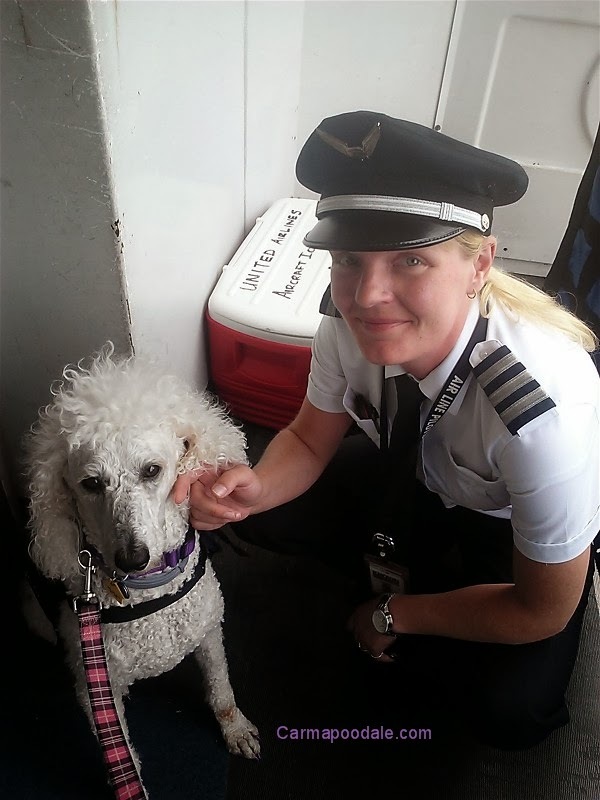 Here is a link -> Delta's requirements One rule they and other airlines have is no dogs are allowed on the seats. 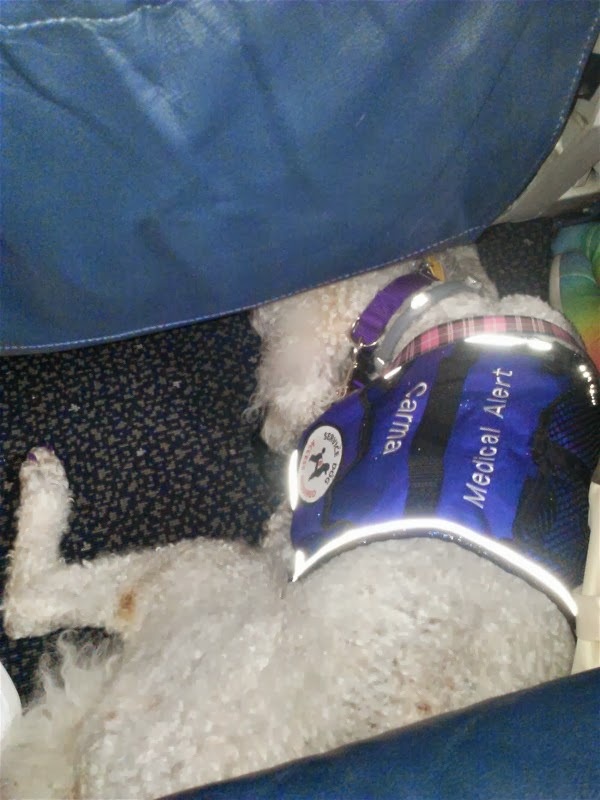 Just as any other passenger with a disability, you are entitled to any available seat in which you are qualified to use and your animal is expected to be seated in the floor space below your seat. No animals are allowed to occupy seats that are designed for passengers. I have flown with Delta 6 times and they were always courteous , helpful and even offered me a cup of water but ma asked for ice instead. The representatives of the airlines we have called and book a flight with have always been friendly, helpful and made us feel like we are their only passenger. We have heard horror stories about traveling but we have only had a few quirks with luggage but never because of me. 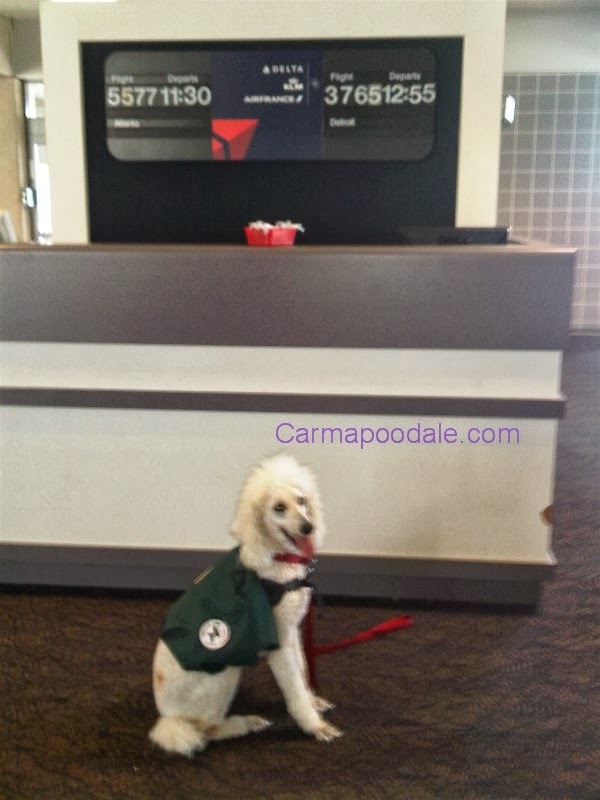 When I am at the airport in my vest, I am strictly a working dog. I do not want people to pet me. I am not a social girl like when I go to conferences or humane society events. When I flew with United Airlines, I had a similar experience except their planes were bigger. We did fly out of a separate airport then we did before. Ma called the airline and reserved our flight and again 24 hrs before we flew. When we board the plane ma always lets me settle in before she gets settled. She thinks about my comfort first. Much more room to lay down. Being it was a larger airport with larger planes I did have more room to stretch out. The head room was higher also. When I got off the plane I heard people saying they didn't know there was a dog on the plane. I also think to myself "what dog? WHERE?" I am a working girl. Our last flight was cramped and since so many were getting off the plane ma decided to just wait before we left our seats. Didn't want to try to get in the aisle with everypawdy but I am glad we did because I got to meet our pilot. 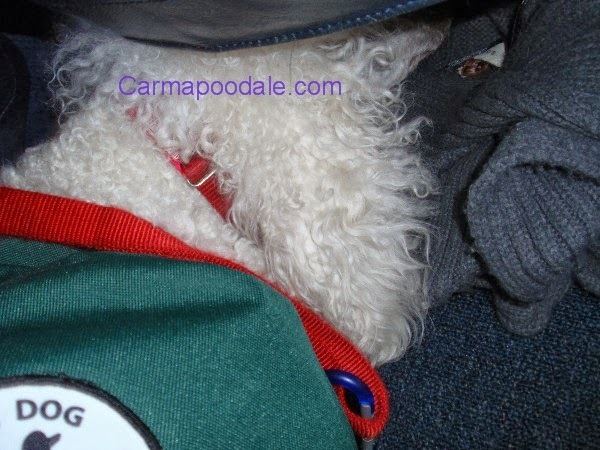 She said she heard there was a standard poodle on the plane and she really liked poodles. United Rules for flying with a service animal can be found here->United Airlines rules *Customers traveling with an emotional support or psychiatric assist animal must provide a minimum 48-hour advance notification to the Disability Desk at the United Reservations office by both 1) calling 1-800-228-2744 and 2) submitting the required documentation (PDF) by fax (1-313-234-6966) or email (uaaeromed@united.com). The Disability Desk must receive and validate the required documentation prior to the time of travel. Verification of documentation will include United contacting your mental health care professional. If we are unable to validate the documentation or if the advance notification is not given, customers will be required to transport the animal as a pet, and pet fees will apply. While at airports there are many ways to catch connecting flights. Some of the obstacles that I had to learn was how to ride a Marta Train. These are fast moving trains to get you to one end of a airport to another. I learned really quick how to sit down and brace ma. She was the one who had a hard time on them. The first one we rode we found out quickly that if sissy Sarah didn't grab her shirt she would have ended up at the other end of the train. BOL! I also took advantage of learning how to ride moving sidewalks and escalators. We don't have those things in Owensboro and it when I was completing my training I was allowed to skip those two things. When we were in Atlanta , we got videos of me riding them to show ma's doctor since he is the one who helped me with my training. Being he is a military doctor , he does things by the book. I really liked the moving sidewalks. You could people watch while being still and I could keep check on ma's legs to make sure they were working properly. I also learned how to ride a escalator. Right before we get to the point where we get off, ma says OFF and I would jump off. After riding a couple of times I learned how to get off gracefully. We did have a lady that made comments to ma about me being on one but ma told her that if the elevator was down she couldn't walk the stairs so I had to know how to use them. People don't understand sometimes that I need to be able to use any type of transportation because its part of my job. I am a full size dog so my ma can't just pick me up. I would never recommend a smaller dog riding these types of moving stairs. 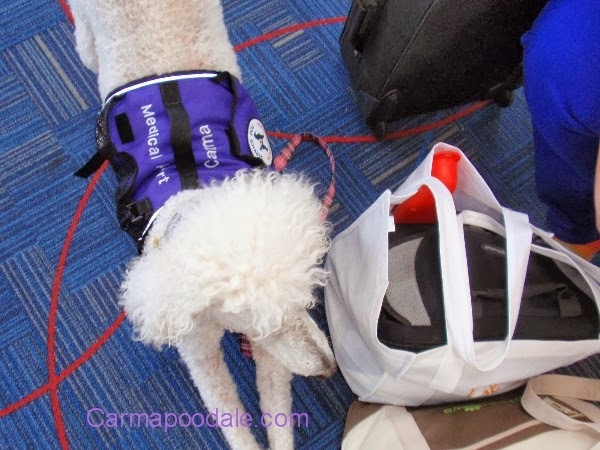 Full size service dogs need to know how to do these things if your handler (pawent) is a traveler. Sometimes not all planes are medium to large. Sometimes they are as ma calls them "crop dusters" These are small 6-8 seater planes that get you from small airports to larger ones. These will give you a whole different outlook on flying. Ma freaked out the first time we rode one but the return trip she was much better and actually enjoyed it. They don't offer beverages but they offer a pawtastic view of the land and clouds. 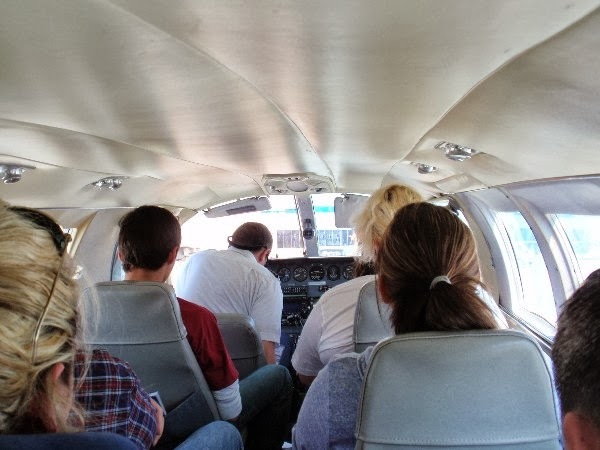 Smaller planes don't issue tickets like the others, you are loaded on the plane by your weight. If you don't like telling your weight then this isn't the plane for you. Since ma weighed the least she had to sit in the back. They even had to know my weight so they could add it to ma's. On the trip going , I laid on the floor beside a door and after we got in the air I sat up and put my head on ma's lap to calm her down. She petted my floof flat. She also popped some calm down pills that I carry in my pouch.I always carry her medication when we fly. This way if her luggage gets sent somewhere else or her purse gets stolen I always have it. I know when she is about to have a panic attack and I will try to advert it. I calm her down most of the time. Sissy Sarah got to sit up in front. Its a packed flight. When we went through security at our airport ma does not remove my gear. She does remove my collar since it has a metal tag and she hands my leash and collar to the security guard and I pass through the metal detectors the same as I do in larger airports. Since on the flight coming back to our hometown was minus 1 passenger the pilot told ma I could sit in the seat beside her. This was so the weight would be distributed. I appreciated being able to lay in a seat. I still keep my head on ma's lap so she can pet me to de-stress herself. It also allows me to keep check on her easier. 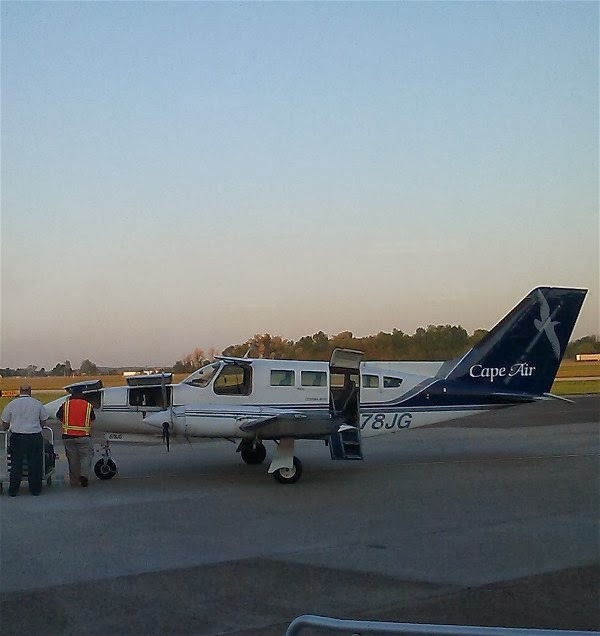 Cape Air is pet friendly as long as you call the airlines first.To view what their requirements are click HERE *We gladly accept live animals on our flights. However, advance reservations are recommended. Only one pet per aircraft may be booked confirmed space. Live animals are approved for travel on a first-come, first-served basis. Multiple live animals from the same family are permitted on the same aircraft; however it is possible that, due to space or weight constraints, the passenger and pets may not be able to be accommodated on any particular flight. The airport is really nice and the staff is really friendly. The planes are a little louder than larger planes but its not bothersome and you can still hear the person next to you speaking. I have been on planes, taxi's , shuttle buses and trains. I have never been on a cruise ship but I have been on a boat. 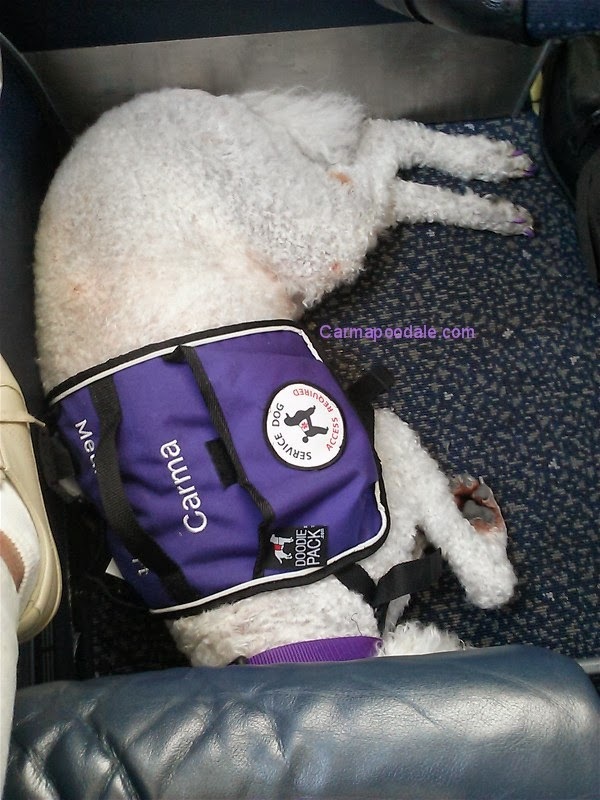 Being a service dog I have to be able to travel and be alert to my handlers condition. I have to work with many distractions. Traveling can be stressful but it can also be a adventure in its own. I am confident that I can be put in any situation and I can keep my ma safe. I am very good at my job. Ma thanks me for helping her get through the traveling part and she tells me she couldn't have done it without me. This makes me know that because of me, she can do things she would have never thought about doing. Sissy Sarah always travels with us but even she will tell you that because of my ability to alert ma of problems before they happen that she is feels more comfortable with traveling with ma. Carry your paperwork- may never need to show it but best to be safe. Be prepared to be searched or swabbed. Know your dog's limitations before flying. 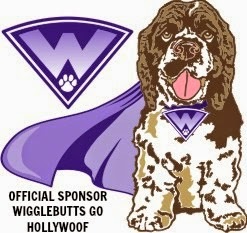 Stay tuned for more information about Medical dogs! We will be co hosting a blog hop to help educated the public on knowing the differences of medical dogs. What a lovely informative post. thank you. 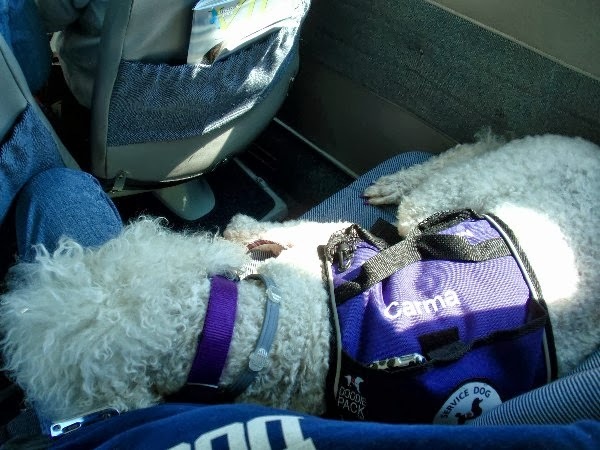 Everything I have been reading lately about service dogs has been a negative experience but I wanted to bring awareness to the positive side of traveling with a service dog. This is a great post! You've given so much useful information. Carma, thank you. I have been around service dogs for years and you shared things I did not know. It also sounds like you are a VERY lucky girl to have such a great boss (handler) and support team. When you retire I see continued work for you as an advocate spokesperson. Your so sweet. Yes I have had years of training and with the help of ma's doctor who is a Army man , he has made sure to throughly trained her. One thing he has always stressed was to considerate of others when traveling and never act like she is above the law. We also ask others to be considerate of us. We do know our rights but we also don't mind answering questions about a service dog and what they can be helpful for. I hope you come back and visit my blog. Soon my friends Oz (www.oztheterrier.com) and Garth (www.twagr.com ) and I will be hosting a blog hop that talks about Service Dogs, Therapy Dogs, ESA Animals and companion pets. We hope to educate people further on how to spot a fake service dog. Very interesting post, Carma. We learned a lot. I'm glad you help your mom out, and I'm glad you haven't had any difficulty flying. We think it's VERY cool you got to meet the pilot of that plane!!!! I also really like that you emphasized being considerate of others. That's so important! I think you can assert your rights and be considerate of others at the same time, and I think you're an excellent example of that.